Series VAC-5000 Single Wrap - Heavy-duty reel to handle 2inch through 4inch I.D. Hose - Accessories - JGB Enterprises, Inc. Heavy-duty reel for longer lengths and large diameters of vacuum hose through 4". Choose gear driven crank rewind or chain and sprocket drive powered by an electric, hydraulic or compressed air motor. Standard: 90° ball bearing swivel joint with female NPT threads. Single Wrap Configuration: use where width dimension is minimal, such as between cab and tank, mounted transverse to frame of truck. Provides effortless and fast rewinding and wrapping of hose. Easy access to hose from both sides of vehicle. A = Air Rewind – Supplied with control valve and 18" air hose. EP = Electric Rewind (1/2 HP) – 12v and 24v DC rewind reels are supplied with switch and solenoid; 115v AC rewind reels are not supplied with switch but can be ordered separately. HD = Hydraulic Rewind – Not supplied with control valve. Hose/Cable Size ft. m lb. kg. A = Air Rewind – Supplied with control valve and 18" air hose. EP = Electric Rewind (1/2 HP) – 12v and 24v DC rewind reels are supplied with switch and solenoid; 115v AC rewind reels are not supplied with switch but can be ordered separately. 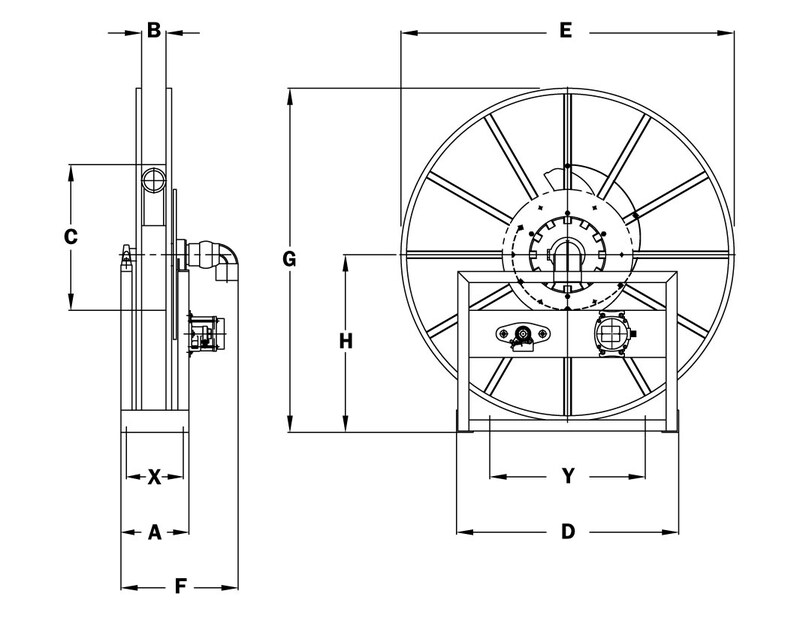 HD = Hydraulic Rewind – Not supplied with control valve. Clutch/reduction unit available upon request. Be sure to check dimensions and weights prior to ordering. NOTICE: A flexible connector must be used between the inlet pipe and the inlet swivel joint.